Read through the obituaries published today on missoulian.com. SEELEY LAKE — Yvonne (Lassise) Mackie, 69, died in the afternoon, Thursday, Feb. 7 at her residence. Brothers Mortuary and Crematory are honored to care for the family. Memories and condolences may be shared with the family at brothersmortuary.com. MISSOULA — Lloyd "Bud" Hanson, 78, of Missoula, died Feb. 6 at his home. Cremation is planned. Sunset Memorial Funeral Home is assisting with these arrangements. MISSOULA — Vaelda G. “Sue” Eddy, 81, of Missoula, died in her home on Thursday, February 7. Arrangements and a complete obituary are pending and will be announced. Cremation is under the care of Cremation Burial Society of the Rockies. SUPERIOR — David J. Allen, 70, of Superior, passed away at his home on the river Saturday, Jan. 26, 2019. He was born Sept. 6, 1948, in Rochester/Webster, New York. He was preceded in death by his parents, Robert H. and Margaret Allen, and brother, Robert K. Allen. He is survived by his wife, Jan; son Alex (Dayna) Allen and their daughters, Trinci and Allurah, of Bozeman; daughter Emily Allen of Whitefish; brother Bill Allen of Lyons, New York; sister Mary Beth Allen of Webster, New York; and sister-in-law Evalyn Allen of Webster, New York. As a young boy, David enjoyed playing and exploring the woods near Irondequoit Bay with his brothers. This early love of nature was the foundation that stayed with him his entire life and lead him to a lifelong love for adventures in the outdoors. In 1967, he graduated from RL Thomas High School, where he was a member of the varsity track, swimming and diving teams. He excelled in diving, becoming an All-American Springboard Diver in New York state. After graduation, he fulfilled his dream to move west by attending college in Bozeman, were he earned a varsity letter in diving from Montana State University. At the University of Montana (UM) Dave was a two time varsity letterman on the Griz Swim team, a two time Big Sky individual champion for one and three meter diving; breaking Big Sky records. Dave graduated from UM with a bachelor of science in health enhancement. On Sept. 3, 1976, he married Janet M. Brockway. The couple moved to Kalispell, where Dave was a swim coach; leading his team to win a number of state championships. He continued his love for coaching with swimmers at UM, high school and community teams in Bozeman and Cody, Wyoming. In 1989, he started his teaching career at Billings public schools. Dave felt very fortunate to be an educator for all age groups from kindergarten through college levels. He was well known for inspiring and motivating his students, as well as for his creativity. Once for class, he taught his elementary students to build igloos on the playground! Dave had a great love for fly fishing and guiding on rivers and streams in the west. 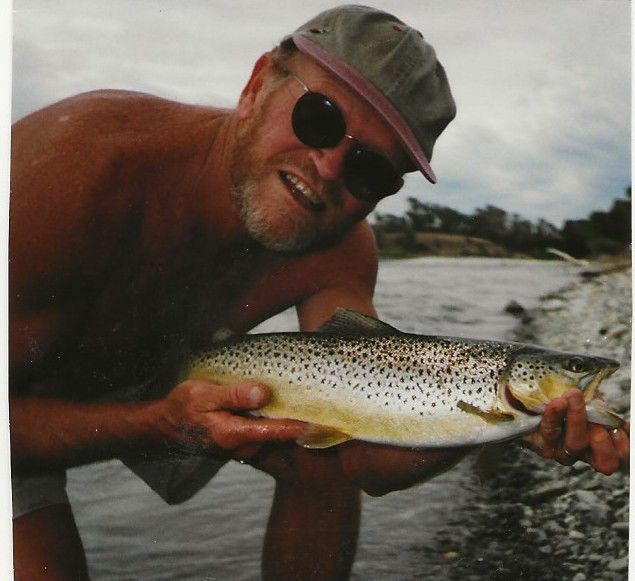 Fly tying became a passion, and he created many flies while dreaming of catching “the big trout.” Some of the best memories were made with family and friends while floating his favorite rivers and telling tall tales around the campfires. In 1990, Dave was diagnosed with non-Hodgkin’s lymphoma, and in 1994, he underwent a bone marrow transplant. During recovery, he couldn’t tie flies or fish, so he became a watercolor artist of fly-fishing bugs and streamers. He sent many of his “buggin’ ya” cards to family and friends. He showed perseverance and tenacity when he was diagnosed with Parkinson's disease in 2017. MISSOULA — Gail Page Roderick, 79, passed away on Feb. 5, 2019, at St. Patrick Hospital, Missoula. Gail was born on March 28, 1939, in Missoula to Harlan and Phyllis Kreycik Page. Gail grew up in Missoula, graduating from Missoula County High School in 1958. After high school she attended Montana State University (now known as the University of Montana) for two years before beginning a life of new adventures. Gail’s parents purchased her a one-way ticket to Honolulu, Hawaii, where she moved in with her cousin Carolyn Long and friends. Gail worked for a CPA in Honolulu, during her time off the girls spent their time exploring the island, enjoying beach time and on one lucky day, she was able to watch Elvis Presley during the filming of his first movie, Blue Hawaii. It was in Hawaii that Gail met Jack L. Roderick, a good looking Navy sailor that won her heart. On September 16, 1961, Jack and Gail married in Honolulu, Hawaii, a marriage that happily lasted her lifetime. Jack eventually left the Navy and joined the Air Force and he and Gail ventured the globe together with their children Jacquelyn Gail and Janice Louise. During the military years, Gail supported Jack in all of his career endeavors, in addition to her loving care of her daughters, she took time out to dabble in her own interests, for which she had a knack of keenly excelling in, including ceramics, sewing clothes without patterns, bowling and even leading a Girl Scout troop while stationed in England. As the girls aged and Jack was looking towards retirement from the military, Gail went on to more schooling in Altus, Oklahoma, in preparation of their move (home) to Missoula in 1980. Gail was hired by McCullough Brothers in Missoula as their secretary/bookkeeper and this job eventually morphed into her working for The Women’s Club, where Gail worked for 25 years as their bookkeeper. At the Women’s Club, Gail quickly became an integral part of the workings of the club, but beyond that the friendships that she developed and the care, love and fun that she had with her co-workers and Women’s Club members was unmeasurable. When Gail retired from The Women’s Club, her and Jack began their travel adventures with their fifth wheel in tow. Thousands and thousands of miles covered, so much life to see and do, and they did it all, together with their dog Sparky. As time went on, they found their most coveted place to spend time was Corpus Christi, Texas, where they enjoyed the warmth of their winters, the beauty of the gulf and the opportunity to eat at Joe’s Crab Shack, her lifelong favorite. Gail’s life was filled with boundless love, giving and caring. For those that she held near and dear, you knew how special you were to her. In 2003 Gail’s granddaughter Rachel began playing travel softball, and for the next seven years, Gail and Jack cheered Rachel and her teammates through hundreds of games, including those played in the rain, sleet and blowing snow. Rachel and her teammates always knew that Jack and Gail’s trailer was their ‘meeting place,’ where there were always snacks, drinks and an ongoing commentary on the recap of their last game! Gail cherished her time spent at their family cabin, visiting with her kids and grandkids along with enjoying the small moments, stories and s’mores by the campfire, picking up windblown sticks to burn, feeding the birds and squirrels, and when she was little, digging angle worms with her father to go out in the little boat for their father-daughter fishing trips. Gail treasured her girlfriends from high school and from the Women’s Club — she was so blessed to have amassed a village of people that cared for her, like she cared for them. Gail’s biggest love was her family, daughters Jackie (Todd) and Janice (Nino), grandchildren, Jacob (Shealey), Rachel (Robert), Hunter and Kara, and to bring a big smile to her face, just mention her great-grandchildren, who loved her as she loved them, Sawyer Marie and Rowan Jaxon. Lastly, Gail loved and cherished her husband Jack — if two souls were ever meant to be intertwined it was theirs. The family will be holding a graveside service at Sunset Memorial, 7405 Mullan Rd., Missoula, Montana, on Friday, February 15 at 2 p.m., immediately following the family invites you to join them in the Community Room for coffee and cookies, to share memories and moments of the remarkable person that Gail P. Roderick was to each and every one of us. Condolences and memories may be shared with the family at whitesittfuneralhome.com. POLSON — Dean Walter Hermes, 74, of Polson, formerly of Williston, North Dakota, passed away Feb. 6, at St. Patrick Hospital in Missoula. He was born on May 8, 1944, in Glen Ullin, North Dakota, to Wilbert and Madeline (Mosbrucker) Hermes. He was raised in Williston where he learned a lifelong love for sports including football and wrestling; he won the wrestling state championship in 1962. After graduation, he moved with his family to Missoula where he attended the University of Montana, earned his teaching degree, and was commissioned into the Army through the ROTC. Shortly after graduation from college, Dean returned to Williston to begin teaching and met the love of his life, Deanna Ihla. They were married April 15, 1967, in San Antonio, Texas, before he left for one year of service in Vietnam. Upon his return, he and Deanna settled in Williston and continued teaching and coaching for the next 36 years. After retiring from teaching in 2000, they moved to their property on Flathead Lake. He was a member of Knights of Columbus, Lions, Sigma Nu, and the Elks. He was voted Williston Education Association Teacher of the Year three times. He was ND football Coach of the Year in 1980 and ND wrestling Coach of the Year in 1971. He was inducted into the North Dakota Wrestling Hall of Fame and he and his son Chris were the first father-son state champions in North Dakota, which made him very proud. He loved spending time with this family in the outdoors including his beloved lake cabin at Flathead, boating, fishing, hunting and golf. He is preceded in death by his parents and younger brother Ron. He is survived by his wife, Deanna of Polson, son Chris (Josie) of Troy and daughter Allyson Diehl (Joey) of Boise, Idaho; grandchildren Mazzy, Marcus, Ricki, Paxton, and Addyson; brothers Rick (Kathy) of Phoenix, Arizona, Bob (Linda) of Missoula and beloved nephews, nieces and cousins. A special thank you to Bernice Zimmerman and all the staff at Hillside Health and Rehab and the wonderful staff at Fresenius Dialysis in Missoula and Polson for their dedicated and loving care. Memorial Mass and reception will be held on Tuesday, Feb. 12, 2019, at 11 a.m. at the Immaculate Conception Catholic Church in Polson, with Father Kevin Christofferson officiating. A private interment will be held at a later date at the Montana Veterans Cemetery in Missoula. Memories and condolences may be sent to the family at thelakefuneralhomeandcrematory.com. In lieu of flowers, memorial may be sent your local Knights of Columbus chapter or Cheerful Hearts of Polson. DARBY — William C. "Bill" Winn, 71, died early in the morning, Wednesday, Feb. 6 at his residence. Brothers Mortuary and Crematory are honored to care for the family. Condolences and memories may be shared with the family at brothersmortuary.com. MISSOULA — Alvera E. Valach, 88, of Missoula, died at her home at the Village Senior Residence on Wednesday evening, Feb. 6. Arrangements are pending and will be announced at a later date. Cremation is under the care of Cremation Burial Society of the Rockies. MISSOULA — John David Miller, 62, of Missoula, died peacefully at St. Patrick Hospital on Feb. 6. Arrangements are under the care of Garden City Funeral Home. VICTOR — Joyce Lenore Holbrook, 88, of Victor, died on Feb. 5 at Valley View Estates in Hamilton. Service details are being handled by Daly-Leach Memorial Chapel in Hamilton. ARLEE — Art was born May 9, 1946, to Louie and Adeline Fyant, on the Fyant family homestead in Valley Creek, near Arlee. Art passed away Feb. 6, 2019, surrounded by family and loved ones. A proud member of the Confederated and Salish Kootenai Tribes, Art was one of thirteen children growing up on the Valley Creek ranch. With no running water or electricity during most of his childhood, he came from a family with modest beginnings, but rich in virtue, love, and respect for others. He attended grade school at the Ursuline boarding school in St. Ignatius. As a young boy, Art enjoyed spending a good portion of his summers staying with his eldest brother, Eddie Vanderburg, who worked for the forest service manning a nearby lookout. Art attended high school in Arlee, graduating from Arlee High in 1965. Art attended Western Montana College, graduating in 1969 with a bachelor’s degree in education. He went on to teach sixth grade in Nespelem, Washington, for a total of five years. Art enrolled in Arizona State University during this time, spending his first few summers as a teacher, earning a master’s degree in education in 1972. In 1974, Art returned to Arlee to teach sixth grade. He built a house on part of the family homestead, where he raised his own family. Art was a school teacher for a total of twenty-seven years, retiring in 1996. He taught over five hundred students, teaching them English, math, history and science. Art took his career seriously, and enjoyed helping kids learn. He was always proud of his former students when hearing of their success as adults. Art had the respect of many parents, students and colleagues. Over the course of many years, teachers were easily able to identify students who had been in Art’s sixth-grade class. He required his students to be prepared to learn, and that was a trait they retained for many years. They also remembered the discipline that Art required as he taught. Art's abilities as a teacher were recognized the year he was retired, as he was named teacher of the year by the tribal education department. Once Art retired, he was able to focus his time and energy into his true calling as a golfer. Art immersed himself in the science and mechanics of amateur golf, winning the men's senior division club championship in 2003 and again in 2004 at the Ronan Golf Course. He developed many friendships and acquaintances over the years on the golf course. In his retirement, Art had the time to enjoy reading all the books he wanted. He loved to read. He was a regular at the Book Exchange store in Missoula, trading in books and always acquiring more. It was not uncommon for him to read over two hundred fifty books in a year. Art was married twice. He always kept himself busy, working on projects during the summer and making a better life for his family. Art was known for his sharp wit, keen sense of humor, and the ability to achieve whatever he set his mind to. Known for his strong work ethic, Art was truly a self-made man, who enjoyed many accomplishments throughout his life. The one thing he was most proud of was being a grandpa to his two beautiful grandchildren, who he absolutely adored. You were guaranteed to bring a smile to his face just by mentioning their names. Art is survived by his sons Steven of Lewistown and Brian (Mindy) of Ronan, and his two precious grandchildren, Aliya and Marcus. He is also survived by his sister Frances Vanderburg of Arlee, brothers Gordon Fyant (Gale) Polson and Robert "Bobby" Fyant of Arlee, and his numerous nieces and nephews. A Rosary will be held at the Arlee Community Center Friday, Feb. 7, 2019, at 8 p.m. A Funeral Service will be held at the Arlee Community Center on Saturday, Feb. 8, 2019, at 11 a.m. Pall bearers are his brothers Gordon Fyant and Bobby Fyant, son's Brian and Steve Fyant, nephews Tommy Sheridan and Jim Steele, and his dear friends Bud Moran, Hank Adams, Dan Luedtke and Brian Cavey.